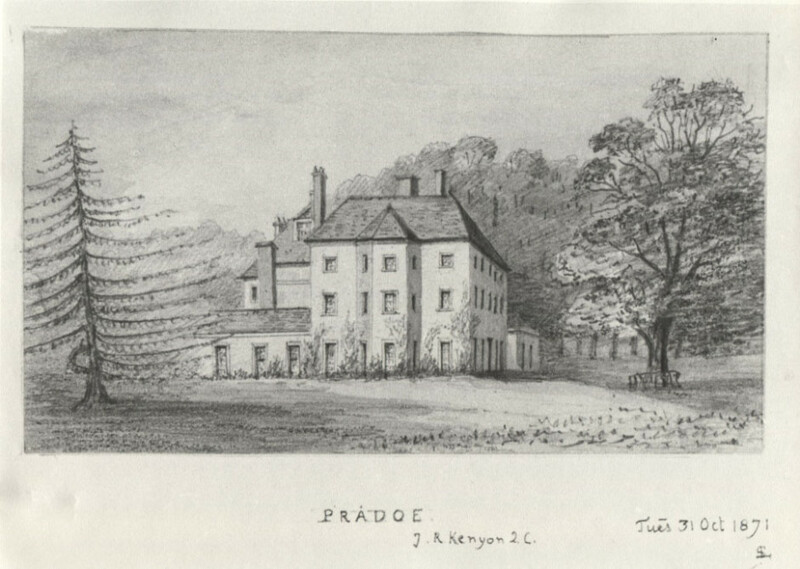 Pradoe was built in the early part of the 19th. century, on an estate purchased by the Hon. Thomas Kenyon, the second son of Lord Kenyon, Chief Justice of the King’s Bench. He was the holder of the rich sinecure office of ‘Filayer’ of the Court of King’s Bench, which entitled him to a fee on every case which was filed, and amounted to many thousands a year. The office was abolished at his death 1851. He was also chairman of the Shropshire Q.S. But the employment by which he was best known, was that of an amateur coachman. ‘His Honour’s’ coach went twice a week from Pradoe to Shrewsbury, and carried passengers for nothing. The small park and well timbered grounds of this place are cleverly laid out. The present owner was a fellow of All Soul’s College, and “Vinerian Professor; he is a Queen’s Counsel; and like his father, Chairman of the Shropshire Q.S. He is also Recorder of Oswestry.